Could conversion and Islam protect a Hindu girl? A Hindu girl accepts a marriage proposal from an Afghan boy. She neglects caution from her parents, wellwishers and resists opposition to the marriage from them. She secretely marries the Afghan boy and elopes with him to the Afghanistan. She converts and takes a Muslim name as ‘Sayeda Kamala’. She lives in the joint family of her husband with three brother in laws, their wives and children. Soon she discovers, shockingly, that her lover-husband already married and that he still continues living with her. Still she reconciles and continues to live in Afghanistan in ancestral house of her husband. She is a trained nurse and she decides to help women of her surroundings with her knowledge. But, the situation in her surroundings is very restrictive to women due to rapid religionalism of Afghan society. She privately provides counselling to sick women. Taliban Islamists find her clinic and orders forcible closure. She resists. And she is beaten in her house by outside men in front of her family members. She was given punishment of death. But, she escapes from her village with great difficulty. Reaches Kabul andl flees back to India. She writes many books, gives interviews, talks freely about anything and everything freely. After few years, she decides to go back to Afghanistan. Probably, she was given assurance by her ‘loving’ husband and family members of her husband. Probably, they were forced to bring her back to Afghanistan. For some reason or for a combination of reasons, she returns after 18 years. She starts to work as a health worker. One day, within few months of her arrival, armed men enter her house. Tie her husband and abscond with her. Later, near a Madrasa, her dead body is found next morning. The corpse had 20 bullet holes. Committment to love, conversion to another religion, and tolerating a polygynist husband could not even ensure safety and life of the girl. 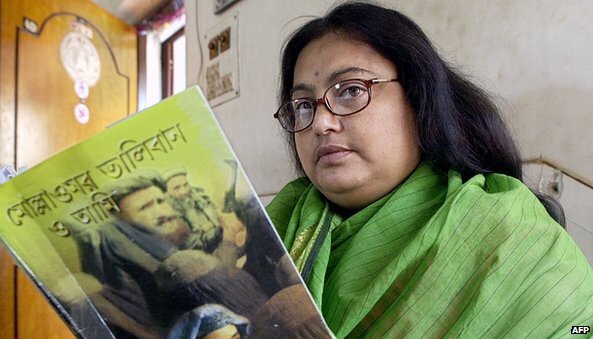 The girl was Sushmita Banerjee who died as Afghan Sayeda. Conversion and Islam, compromise, sacrifice, and perseverence could not save the Hindu girl.